King Solomon tells us it’s prudent to avoid deceitful and lying types – and there’s no shortage of those people around with a seemingly endless stream of scams to trap the unwary. And these scammers are making big money with a few old real estate scams in slightly new clothing. Case in point: a very simple real estate “bait and switch” that recently netted a New York con artist a cool $22,000. We’ve brought you news in these pages about a variety of scams and frauds masking the rounds of real estate transactions both online and off. And while vigilance is usually the key to avoiding getting burned, sometimes the scam looks so straightforward it’s hard to spot the catch. That’s what scammers are counting on when they place ads (usually on Craigslist but also on other kinds of real estate listing sites) for homes and apartments for sale or rent. There’s just one catch. They don’t actually own the places they’re posting about. So when interested parties respond, the scammer may show the place, collect deposits or – in some especially brazen cases, a sale price – and then disappear. That’s what happened in New York’s East Village, where a man claiming to be the owner showed 10 people a vacant apartment, collected $2,200 in deposit money from each of them and then vanished. When the would-be renters tried to finalize the transaction, they found that the apartment was owned by someone else and that it wasn’t actually up for rent. There was no hops of recovering their lost money – or of tracking down the bogus seller. The same scenario is played out on home and apartment listing boards across the country. Some transactions are conducted entirely online, with hungry buyers sending a “seller” large deposits or, in some cases, the whole purchase price of a dwelling on the basis of a few photos or a talk with the scammer, who often pressures them into moving forward fast with a story of unhappy circumstances. The properties used as bait typically come from real listings pirated from other sources – or local properties the scammer has personal knowledge of, as in the New York City case. 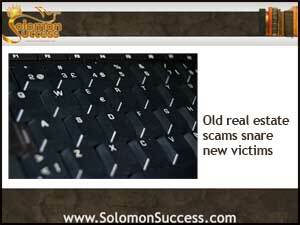 The scam joins a long line of similar traps laid for unwary renters and buyers. But because it appears so transparent and above board, it’s easy to become snared. The solution, real estate fraud experts say, is to be as diligent as possible. Don’t send anyone money for a property sight unseen. Resist hard sells, sob stories and other kinds of pressure tactics to close a deal before you can think. That might include a look at property records or a call to a building’s manager to confirm the details.